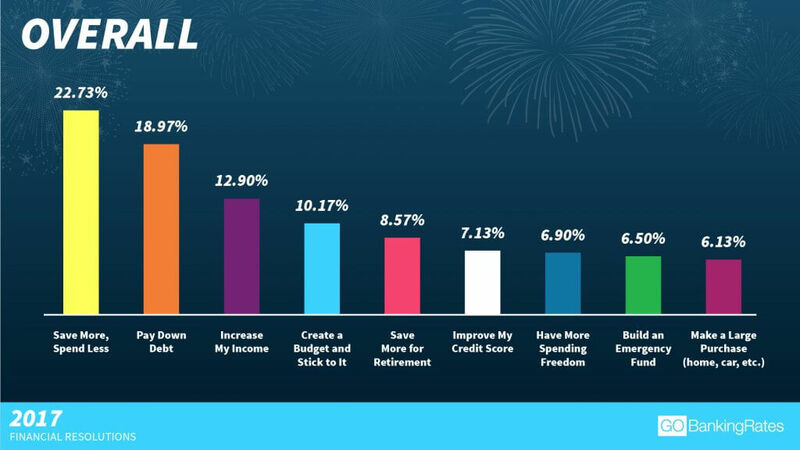 Many Americans' New Year's resolution ideas involve improving their finances. Lose weight, live a healthier lifestyle, enjoy life to the fullest — these are all popular New Year’s resolutions people make in hopes of improving their lives. But what about improving your financial life? GOBankingRates found that money is what Americans think about most. So, what are people resolving to do to improve their finances? Our findings include the most popular financial resolutions overall, as well as insight into the resolutions Americans are making by age, gender and income. Keep reading to see some of the most popular New Year’s resolution ideas — and learn how to get on top of your finances in 2017. “Save more, spend less” is the most popular financial resolution for 2017, with nearly 23 percent of respondents vowing to do this in the new year. This resolution’s popularity isn’t surprising, given that GOBankingRates’ 2016 Savings survey found that 69 percent of Americans have less than $1,000 in a savings account. When it comes to personal finances, getting out of debt is a big focus for many Americans. In fact, it’s their biggest source of financial stress, which likely explains why it’s a popular 2017 New Year’s resolution. About 19 percent of respondents said “getting out of debt” is their top financial resolution this coming year. Overall, a larger percentage of people are focused on improving their finances rather than taking on more debt or spending more in the new year. A little over 6 percent of respondents said their top resolution is making a large purchase, and only about 7 percent want more spending freedom. See: The No. 1 Cause of Financial Stress in the U.S. Despite the fact that many millennials are burdened with student loan debt, baby boomers are the ones more likely to vow to pay down debt in the new year. The GOBankingRates survey found slightly more than 26 percent of adults ages 55 to 64 are resolving to pay off debt in 2017 versus about 9 percent of 18 to 24-year-olds and almost 20 percent of 25 to 34-year-olds. “Pay down debt” is the most popular resolution among adults ages 25-44. “Save more, spend less” is the most popular resolution for adults ages 18-24, 45-54 and 65 and older. “Increase my income” is a more popular resolution among younger respondents than older ones — likely because millennials earn less, on average, than older workers. “Save more for retirement” is an unpopular New Year’s resolution among millennials. This resolution grows in popularity as the sample size gets older. “Create a budget and stick to it” decreases in popularity, for the most part, as the sample size increases in age. 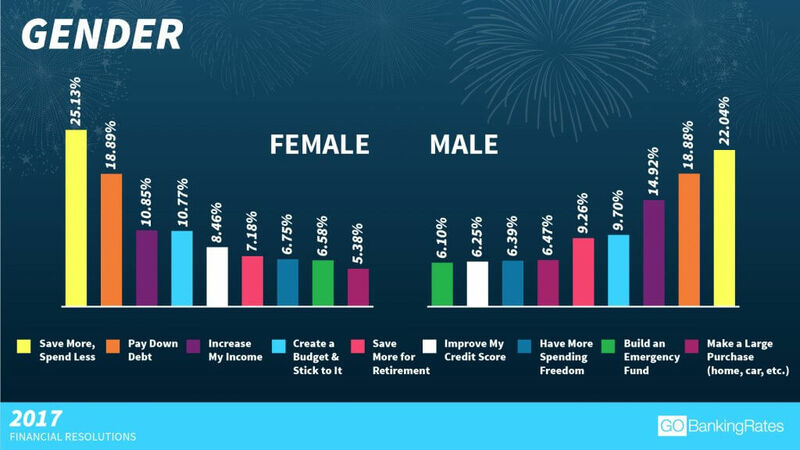 Like the overall findings, the most popular New Year’s resolutions for both men and women are “save more, spend less” and “pay down debt.” However, a greater percentage of women than men are vowing to save more and spend less in 2017 — about 25 percent versus 22 percent. Men, on the other hand, are more likely to want to increase their income in the new year, with nearly 15 percent picking this as their top resolution versus 11 percent of women. Considering there is a significant gender pay gap in the U.S. — women working full time are typically paid 80 percent of what men are paid, according to the American Association of University Women — this result is slightly surprising. Although women seem to be more serious about saving money, in general, only about 7 percent of women chose “save more for retirement” as their top 2017 financial resolution versus more than 9 percent of men. It’s interesting women are less likely than men to vow to save more for retirement since they’re more behind on their retirement savings. According to GOBankingRates’ 2016 Retirement Savings survey, about 63 percent of women respondents said they have no savings or less than $10,000 versus only 52 percent of men. Women are also slightly more likely than men to vow to “improve their credit score” in 2017. “Build an emergency fund” is the least popular financial New Year’s resolution among men. “Make a large purchase” is the least popular resolution among women. Among the highest-earning survey respondents — those earning $150,000 or more — “increase my income” is the most popular resolution. The fact that the wealthy set goals to earn more might explain how they accumulated and continue to grow their wealth. “Save more, spend less” is the most popular resolution for all respondents earning less than $150,000. “Build an emergency fund” is one of the least popular resolutions for survey respondents earning less than $150,000 — even though GOBankingRates’ 2016 Savings survey found that they’re less likely to have money in a savings account. 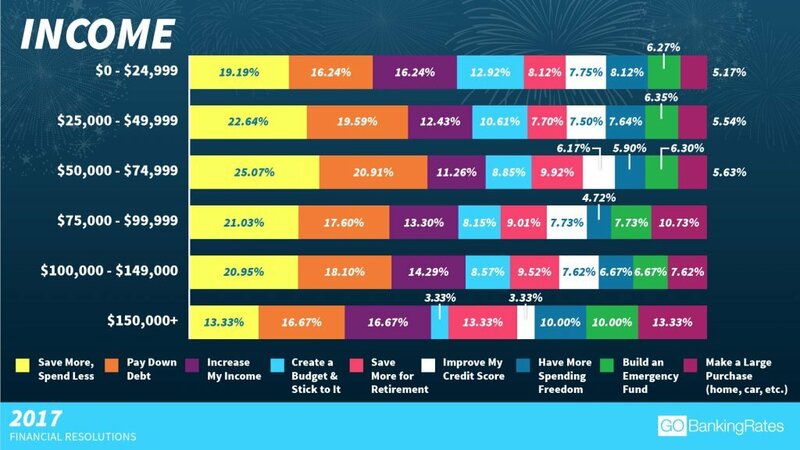 “Create a budget” is a more popular resolution for lower-income respondents, especially those earning $24,999 or less. The lowest and highest income groups are more likely to vow to “have more spending freedom” in 2017 than other income groups. 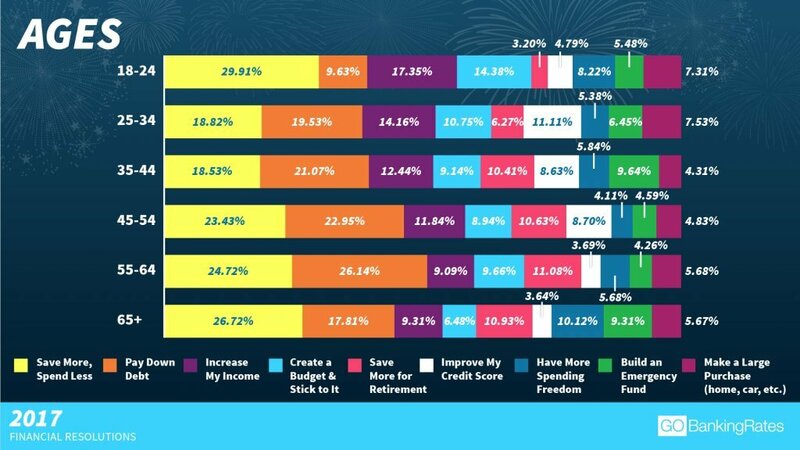 It’s encouraging that Americans are resolving to improve their finances in 2017. However, the key is to actually stick to those New Year’s resolutions. One way to follow through on the most popular resolutions — save more, spend less and pay down debt — is to use automation, said Ken Hevert, senior vice president of retirement at Fidelity. Set up automatic monthly transfers from your checking to savings accounts. And, make automatic monthly credit card payments that are higher than the minimum due. “If you automate it, it creates so much more discipline and takes the emotion out of how much you should send,” said Hevert. Another way to stick to a resolution is to break it down into smaller, more attainable goals. Let’s say you want to create a budget and stick to it. Make a goal to review your spending from the previous month to see where your money is going. Then, set a goal to download a budgeting app such as Mint to keep track of your spending going forward. Also, write down your resolution. “That makes it real for people,” said Hevert. Let a family member or friend know about your goal so someone can hold you accountable for reaching it. And lastly, reward yourself when you reach your goal. Perhaps take a day off from the gym or have a fun night in with friends or your significant other. Just make sure the reward doesn’t require spending money, said Hevert. Methodology: This survey was conducted as a Google Consumer Survey and collected responses from 5,097 people. The findings are representative of the U.S. online population with a margin of error of 2.7 percent. The survey posed the question, “What is your 2017 financial resolution? (choose one)” with the option to select “None of the above,” or to select one of the following nine resolutions: (1) create a budget and stick to it, (2) build an emergency fund, (3) improve my credit score, (4) save more, spend less, (5) increase my income, (6) pay down debt, (7) save more for retirement, (8) have more spending freedom and (9) make a large purchase (home, car, etc.). For the analysis of resolutions, respondents who selected “none of the above” (41.14 percent) were excluded. Insights were found using only respondents who selected one of the nine resolution choices. St. Patrick's Day food and decor don't have to cost a bundle. Learn more! Learn how to improve your credit score by taking these steps.